Auto-enrolment has become an integral part of every employer’s financial administration process. Many employers need their payroll bureau, accountant, bookkeeper and/or financial adviser to play a central role in ensuring they become and remain compliant with their auto-enrolment obligations. 1. What is auto-enrolment and how does it work? 2. How can advisers engage most effectively with their clients, select a quality scheme and manage ongoing administration? 3. How do Smart Pension's advanced technology solutions help simplify and facilitate engagement with the auto-enrolment administration process? 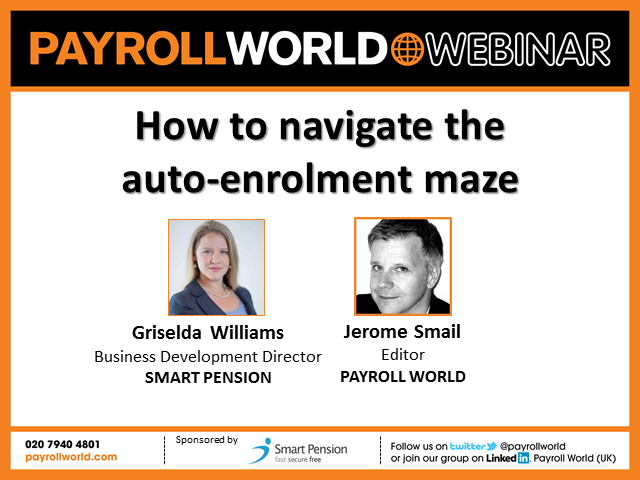 In today’s discussion, Griselda Williams and Mat Castle, Directors of Business Development at Smart Pension, will explore these questions and outline ways to help you engage with auto-enrolment in a way that is simple, time efficient and cost effective for both you and your clients. International payroll management can have layers of complexity due to ever changing employment law and complex tax and payroll legislation. Add to the mix different cultures, payroll calendars, language barriers and communications challenges, what practical steps can you take to keep everything on track? Consulting editor at Credit Strategy and Credit Awards judge Fred Crawley gives his top tips on writing an award winning entry. • CSV files are a hugely antiquated way of transferring data. Over 60% of payment data received contains an error. What changes can be made in the new auto-enrolment world? • API technology is changing the modus operandi, but the market is responding at different speeds. How can you get up to date? • With margins already tight, selection of payroll software and pension provider will directly impact bureau efficiency. Find out how a digital interface with key software providers can help. • Make savings via new technology. • How can you and your clients benefit from not only an efficient solution for auto-enrolment, but also a “one stop shop” for a wide range of insurance needs? Auto enrolment will affect millions of employers by 2018. From our research we know that up to three-quarters of them will turn to their accountant or payroll professional for support. This free webinar will show just how easy it can be for professionals to offer the flexible auto enrolment support clients need. During the broadcast, FCA director of competition Mary Starks and Richard Koch, head of policy at the UK Cards Association, will join Credit Today’s managing editor Fred Crawley for an hour’s discussion on the report, with time for questions & answers from listeners. Register for this FREE webinar now and join the discussion on how to tackle indebtedness in the UK cards market. At 12:00 on 20 May, join Payroll World and Equiniti International Payments to learn what a payroll manager should be thinking about when their business expands overseas. Andy Brown, operations director of international payment specialists, Equiniti International Payments, will identify the most common pitfalls faced by payroll professionals in such a situation and explain how to mitigate the financial risk of having an international payroll. At 12:00 on April 29, Payroll World editor Martin Kornacki will be joined by Carval’s payroll bureau manager Michelle Ginnelly to learn how organisations running third party payrolls can make pension reform a success for their business. This webinar is aimed directly at those running third party payroll services, such as accountants or bureaux. Take this opportunity to learn more about this topic, register for the webinar today! * Five ways in which fraudsters steal identities: the coffee shop wifi hack, the local government census, social media techniques, the offer you can't refuse, the catchers supermarkets. * What Jumio’s team of researchers heard first hand when they spoke to convicted ex-fraudsters, professional criminologists, law enforcement practitioners and fraud managers to uncover some of the exploits that fraudsters use. - How do I know what information is required when paying in overseas currency to ensure safe delivery? - Is it better to centralise or decentralise international payroll payments? * Invaluable hints and tips on how to set out your submission. • With the changing demographics how do you accommodate different needs like online payslips, benefits, etc? Payroll and HR departments are facing continual pressure in the current economic climate to do more with less. Already 2014 is sizing up to be another challenging year for the departments. Join Payroll World's editor Martin Kornacki and payroll & HR solutions expert Steve Jemmott from Sage as they explore a free payroll and HR toolkit designed to help you identify your department’s evolving needs and the best ways for you to fulfil them. -In light of auto-enrolment payroll is acting as the conduit between finance and HR and delivering a fully complaint best practice service to the benefit of all employees, how can the department capitalise on this? -In light of changing dynamics in company internal relationships between payroll HR and finance how does a successful payroll bureau understand and interact with these very different departments to achieve best practice? -Will payroll managers ever get to the status of director? This webinar will feature a number of key judges on the Payroll World Awards judging panel who will offer potential entrants advice on how to put together a winning entry form. Drawing on examples of previous award winning entries, plus tips and hints on how to set out your entry form. Make sure you tune in for a helping hand. Join Payroll World’s editor Martin Kornacki and Ceridian as they explore the benefits of using one integrated solution for a company’s payroll and HR needs. featuring webinars for Credit Strategy, Payroll World and Insolvency News.